Funtastic held on to win the United Nations Stakes at Monmouth Park. Photo By Bill Denver/EQUI-PHOTO. It’s hardly a surprise when trainer Chad Brown wins a major grass race. But it is shocking when he does so at 23-1. That’s what happened in Saturday’s Grade 1 United Nations when the Brown-trained Funtastic – by far the longest price of the four horses he had in the nine-horse field – went gate to wire under jockey Antonio Gallardo to score a half-length upset over stable mate Money Multiplier at Monmouth Park. The winner returned $48.00 and the victory was the first in a Grade 1 race for Gallardo. Funtastic, making just his ninth career start, was also making his graded stakes debut. “I knew it was a tough race,” said Brown. “The owner, (Three Chimneys chairman) Goncalo Torrealba, really deserves most of the credit here. He was sure this horse could stay a distance of ground in the mile and an eighth, mile and a half races, in the Grade 1 class. Funtastic covered the mile and three-eighths in 2:12.36. After Gallardo hustled the 4-year-old son of More Than Ready-Quiet Dance out of the gate, it became a game of catch-me-if-you-can. No one could. Money Multiplier, ridden by Joe Bravo, made a bid in mid-stretch but could never get by. It was another 1½ lengths back to Bigger Picture, who won the United Nations a year ago. “Probably my first year of training,” said Brown, who has won the Eclipse Award as the sport’s top conditioner the past two years. Dream Awhile, the prohibitive favorite in the field of five fillies and mares, captured the Grade 3 Eatontown Stakes for Brown on the undercard, with jockey Irad Ortiz keeping enough in reserve to hold off Special Event by three-quarters of a length. Dream Awhile covered the mile and a sixteenth on the grass in 1:41.59 and paid $3.00 to win. Speed also ruled in the Grade 3 Iselin Stakes as Harlan Punch went gate to wire under Joe Bravo in the mile and a sixteenth race for 3-year-olds and up, with the field reduced to four due to three late scratches. Harlan Punch, the slight 6-5 favorite, covered the distance in 1:44.53. It was another 5¼ lengths back in second to second choice Page McKenney. 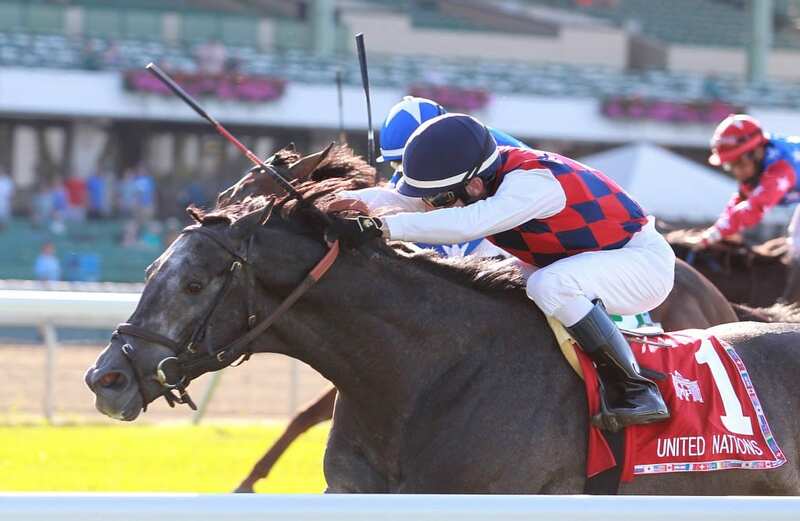 Divine Miss Grey, trained by Danny Gargan, appeared to earn a shot at the Matchmaker Stakes on Haskell Day, July 29, with her victory in the $75,000 Lady’s Secret Stakes. Ridden by Kendrick Carmouche, Divine Miss Grey held off Moonlit Garden and Bravo by three-quarters of a length after breaking to the front from the outset.